Share content; make your own content shareable. When I present to groups on Internet marketing, I elicit the most groans not from my jokes, but when I talk about getting social online and sharing content. My message is, I’m afraid, “Sorry. You gotta do it.” Groan. Add value. Whenever you share an item, on Facebook, Twitter, LinkedIn, Google+ or wherever, think first about whether it provides value to the recipient. Is it interesting or useful? Amusing? A head scratcher? These are good items to share and people will want to get more from you as as a result. Do not, I repeat, do not pitch your goods or services all the time. That turns people off, just like it would in the physical world. Be shareable. That cool content should be easy for others to pass along. People especially like to share pictures and videos, so think about sharing them to begin. To be shareable, you have to be in the places (e.g., Facebook, Google+ and etc.) where people share. Don’t share too much or too little. Unless you have amazingly terrific content, a little goes a long way. Again, think of the physical world. Do you like the blabbermouth? Use your own voice. People like to be social with you in person because you are who you are. Be who you are online and people will follow. Don’t overdo your own voice and don’t confuse your business voice with your personal voice. Remember, you have a business open to the public. You want customers. Make sure that it is your business voice that resonates, and that it is a welcoming voice. Importantly, ensure to have separate online assets (e.g., separate personal and professional Facebook pages) for personal and professional use. Don’t conflate or confuse the two. And as a general rule, don’t post anything that you wouldn’t want your grandmother to see. Make sharing easy. On your website, include sharing buttons after every post, or in a sidebar or footer, or all of the above. Encourage people to share, just like we do. What did we miss? Leave a comment below. Image source: GoatCloud original. 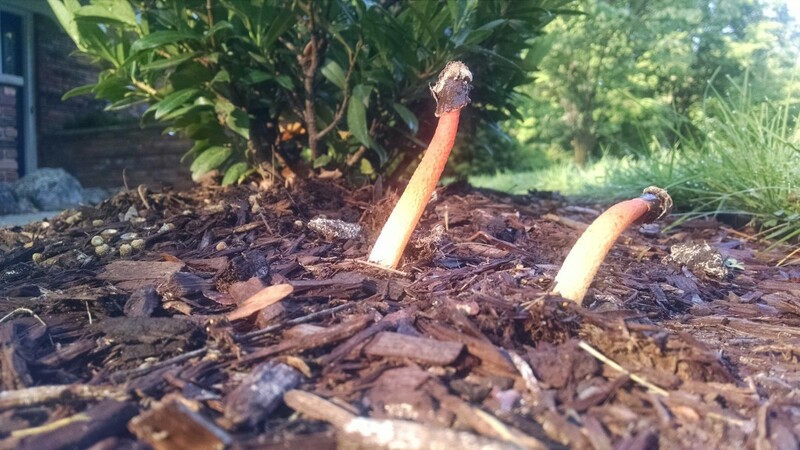 Stinkhorn mushrooms preparing to share their, well, essence. Let us know if we can help you to share your content and get social online.